Dipankara— «Lamp bearer», one of the Buddhas of the past, said to have lived on Earth one hundred thousand years. Theoretically, the number of Buddhas having existed is enormous and they are often collectively known under the name of «Thousand Buddhas». Each was responsible for a life cycle. According to some Buddhist traditions, Dipankara (also Dipamkara) was a Buddha who reached enlightenment eons prior to Shakyamuni, the historical Buddha. 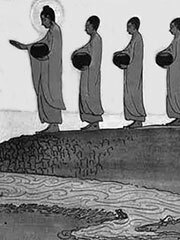 Generally, Buddhists believe that there has been a succession of many Buddhas in the distant past and that many more will appear in the future; Dipankara, then, would be one of numerous previous Buddhas, while Shakyamuni was the most recent, and Maitreya will be the next Buddha in the future. By the 17th century, Dipankara had become a figure of veneration in Nepalese Buddhist communities. These followers consider him a protector of merchants and associate him with alms-giving.